The fractal or law of relative relationships is a vital key in understanding religious cosmology. A fractal is a mathematical construct or set that typically displays self-similar patterns or a pattern that is exactly the same at every scale. This is why it is also called the Law of relative relationships, or a system which shows the same relationships at every scale. Plato elaborated on this observed phenomena and coined the words microcosm and macrocosm. A tree is a great example of a fractal pattern, in how the veins on a leaf look like a twig which looks like a branch which looks like a bigger branch and so forth. An atom with its sub-atomic particles and electron cloud is loosely like a Sun with its planets and Oort cloud, which is like a galaxy with its associated matter and energy clouds, which is like a super cluster, etc, etc… Many ancient and modern mystics have used this idea to suggest that a man with his endocrine system and energy centers is a microcosm or fractal of the solar system, galaxy and other levels of the cosmic pattern. LDS Scripture alludes to universal fractal pattern in its ubiquitous symbology and even directly in D&C 52:14. By studying the fractal patterns in directly observable things like human physiology and our earth/solar system, religious systems have sought to explain and understand the cosmology of the universe as a whole. This pursuit proves both fruitful and confusing. Confusion has abounded as mystics and scripture often employ the use of symbolism, shadows, types and dualism in an attempt to refer to multiple levels of the fractal pattern. A mystic may speak of the “3rd heaven”, but readers may become confused not knowing whether they are speaking of an unseen other-dimensional spiritual heaven that is part of the earth, or a visible heaven that exists as a separate planet somewhere in the galaxy— or both. In fact because most of humanity’s understanding of astronomy has been so rudimentary through the millennia, the meanings of most scriptural words concerning heaven or the cosmos have become completely lost or distorted. Concepts like heaven, celestial, resurrection, translation, and the like, tend to be ambiguous and confusing because so few understand the various levels of the multidimensional fractal patterns the Mystics who use them were referring to. By understanding that the levels and realms of the earth’s spirit world exist as a microcosm or fractal of the galactic levels and realms, we can much better understand scriptural symbolism and allegory. Left: The Tree of Life is an esoteric teaching of the fractal pattern or macro/microcosm nature of creation. The leaf is a small version of the twig, which is a small version of the branch & root which is a small version of the tree. Each level of the fractal is connected to all others and teaches you the patterns inherent in the whole. Another reason that a scientific understanding of a fractal is important is in how it helps us understand the way intelligent life evolves or progresses in our galaxy. Evolution is galactically guided and only random within very constrained bounds. All mineral, animal and intelligent life in our galaxy follows the fractal pattern which was embedded into the fabric of our galaxy at the beginning of its creation. Knowing that we are a part of the galactic fractal helps us to understand that the things which have and are occurring on our world, follow a pattern of things also occurring on other worlds in our galaxy. To understand the pattern and how it is embedded in all life as we know it, is to realize that we are not alone in this galaxy. That which happens here, is the same as what has been done on other worlds. It is almost ridiculous to see the patterns in our world and galaxy, realize they exist in a fractal relationship and then suppose that there is not a preponderance of inhabited world in our galaxy which are either evolutionarily ahead of or lagging behind our earth. In relation to understanding cosmology, religion and ourselves, the most important fractal is that which I define as the toroidal field generating unit. In relation to us this unit includes; the atom, the human body, the planetary body, the sun (solar body) the galaxy and the multiverse/singularity or God. Each of these fractal levels contain the full set of relationships needed to understand the full pattern of cosmology and intelligent life in our galaxy. As we will explore in a moment, each contains the spiritual & physical dichotomy, the geometric relationships, and the quantized divisions of matter and energy to help us understand ourselves, higher beings, heaven & earth, life after death, and evolution of consciousness. Each incremental unit of the galactic fractal has a solid positively charged nucleus exhibiting properties of physical matter as well as an oppositely charged energy field containing dualistic wave/particle properties. [add another small section giving specific examples of how fractal relationships are used in the religions of the world. The biggest examples are the chakra divisions of the body, and the “spirit bodies” of hindu and new age teachings. Or perhaps put it down with the spirit world since it is a fractal of that?]. Some Divisions are relative, often arbitrary and change over time. If you’ve ever studied the different calendar systems of the modern or ancient world, you know that the divisions we attach to time and space are somewhat arbitrary. Time on earth is based on earth’s position in space (specifically the Solar System). And since there are many different repeating cycles in our orbit, each culture tries to divide the times into divisions which make the most sense for them at the time. 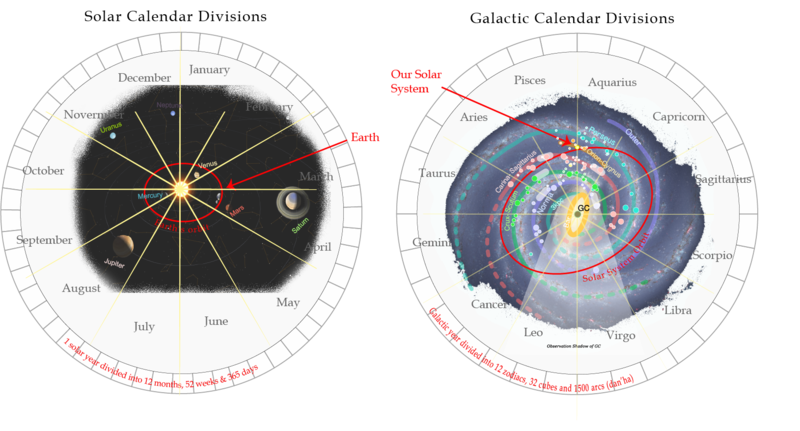 For example, some cultures used 12 month calendars and others used 13 months. Some used 365 day calendars and others 260 day calendars. The same is true for pretty much all classifications; some physicist say there are 3 states of matter, and others say 4. Some say there are 7 continents and others 5 or 6. These concepts underlie the truth of relativity in the universe. Truly at some level ALL things in the universe are relative. Time, space and distance are all relative to each other. If one changes, the others change. This relativity is one of the things that makes a description of cosmology or the afterlife so difficult. According to Oahspe and other sources, the cosmological divisions of the Spirit World or Resurrection are not only a bit arbitrary (changing depending on who is describing them), but they are also relative and change with time as the earth makes its way around the galaxy. So because of the differing energy densities in the galaxy, what would be described as a 3rd density or telestial glory at one point in time, might become the 4rth density or terrestrial glory at another point. So when discussing heavenly divisions we must ask ourselves what time or space are we speaking relative to? In the LDS Doctrine and Covenants we see that the saints began thinking about the consequences of cosmic relativity and time-frames given in scripture. 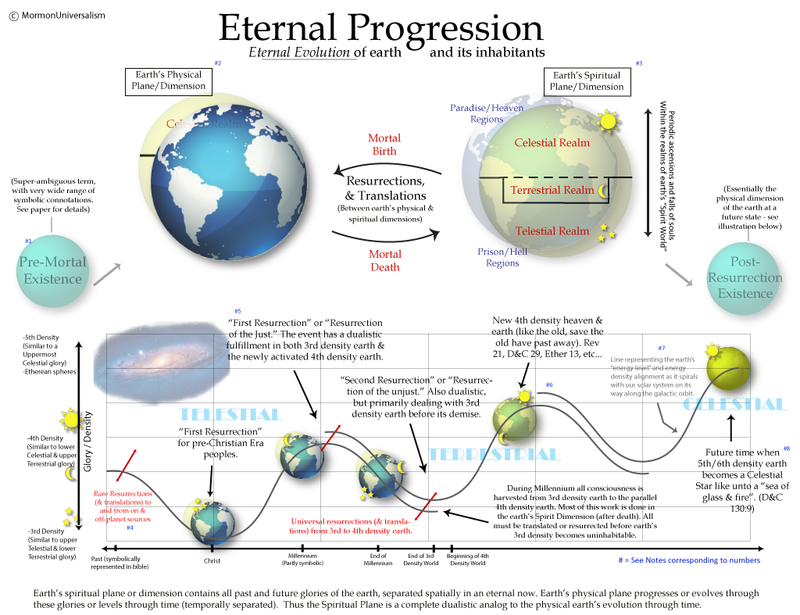 4 In answer to the question—Is not the reckoning of God’s time, angel’s time, prophet’s time, and man’s time, according to the planet on which they reside? Oahspe speaks of how although the above statement may be true, there are issues with relativity because the Spirit World where most revelation comes from has a different time-frame than the earth. 20/18.8. Let man compute My times for his own benefit; I created the first wark [energy shell of the earth equating to a realm in the Spirit World] to gain in rotation faster than the earth, one year for every eleven. So that when the wark has made twelve of its own years, the earth shall have completed eleven years. Oahspe explains that not only do these regions have differing time-frames, they also expand and collapse depending on the energy density of the region of the galaxy the earth is travelling through. So just as the earth’s magnetic field expands and deflates depending on the intensity of the solar wind (see animation below), the earth’s spirit world or spirit dimension expands and deflates with the galactic wind. We can compare the relativity involved in classifying the realms of the spirit world to the way we classify the rainbow of light created when shining light through a prism. Depending on the concave/convex nature of the prism, we might classify the color spectrum as simply three primary colors (RGB), or possibly four or the usual seven; it is all relative and a bit arbitrary. However, if we remember that each division exists as a small fractal of a greater whole, we can create descriptive divisions which better describe the cosmos because they are true types and shadows applicable to multiple levels of the fractal whole. This is what great religious mystics and scientists have sought to do since ancient times. Some texts suggest that the earth’s spirit dimension expands and contracts through time like the earths magnetic field (shown left), and is divided into subjective divisions like the colors of the color spectrum (right). Ancient art, scripture and mythology has a strong tradition of using certain numbers & shapes in their symbolism. Channeled texts like The Law of One suggest these revealed symbols were an attempt of higher beings to loosely summarize very complicated concepts explaining the physics which governs the major divisions of our galaxy. Some of the most fundamental and popular of these are the circle, triangle, star & dodecahedron equating to the numbers 1,2,3,7 and 12. The Hindu traditions possess many more, but all are keys in unraveling the multidimensionality of our galaxy. Modern physics is beginning to see in detail how these numbers and shapes relate to the fractal relationships we have been discussing. Specifically these shapes relate to the configuration of electromagnetic fields such as the electron energy shell configurations. This is pertinent in our discussion because it will show how modern scientific classifications in electron orbitals accords with and vindicates ancient mystical descriptions of the afterlife, as well as being the key to aid humanity in agreeing upon a global classification which will harmonize religious and scientific cosmology. The number one is a non-dimensional point. It is symbolized by the circle and is zero dimensionality in which all space-time is unified. It is the ground state of an orbital shell. Two is a line formed by connecting two points. It symbolized the most basic duality and polarity in the universe. It represents space with a measurable dimension of distance. Three is the tetrahedron of which the triangle is the two dimensional representation and is formed by adding a third point and three lines connecting them. It is space with time. Seven is two combined triangles or the double tetrahedron of which the Star of David is a two dimensional representation. …. Twelve is an isotropic vector matrix… which is related to the dodecahedron. 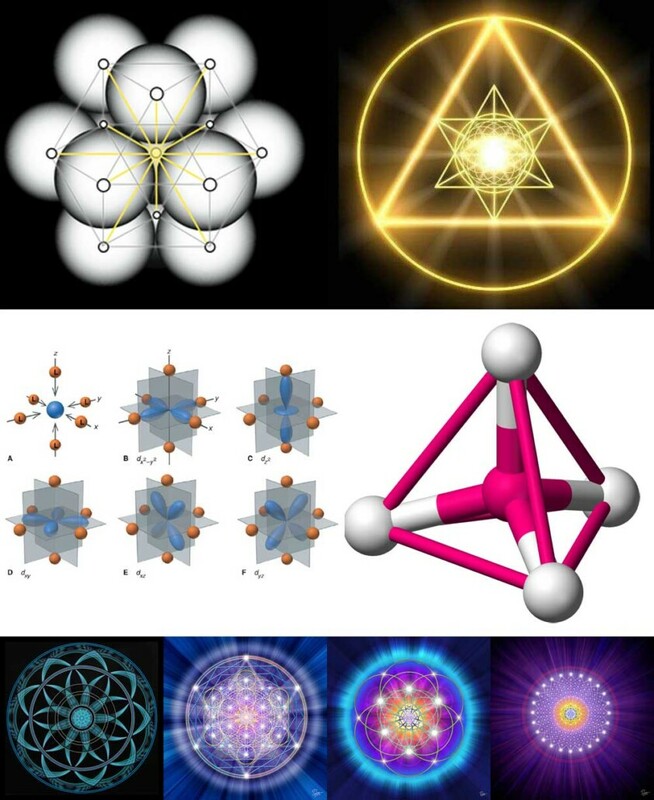 Check out cosmometry.net for an example of these unique relationships and the “fractal holographic nature of the universe”. [add a little more information/outline of how these numbers/shapes relate to electron orbital shells). A few shapes and symbols prevalent in the world’s sacred geometries. See cosmometry.net for some great examples on how the shapes embedded in religious iconography relate to modern physics and the multi-dimensionality of the universe. Many, many books have and could be written on the association of these numbers, shapes and their relationship to religious revelations concerning God, the multi-dimensional structure of the galaxy and our progression through it. But to try and be succinct I will quote from Chapter 9 of the Aquarian Gospel of Jesus Christ which speaks of these numbers and their relationship to God, Taoism, Hebrew religion and later Hindu/Buddhist religion. We will then use these as a launch pad for our description of cosmology and man’s eternal progression. 14 Then let us study God, the One, the Three, the Seven. 15 Before the worlds were formed all things were One; just Spirit, Universal Breath. 16 And Spirit breathed, and that which was not manifest became the Fire and Thought of heaven, the Father-God, the Mother-God. 17 And when the Fire and Thought of heaven in union breathed, their son, their only son, was born. This son is Love whom men have called the Christ. 18 Men call the Thought of heaven the Holy Breath. 19 And when the Triune God breathed forth, lo, seven Spirits stood before the throne. These are the Elohim, creative spirits of the universe. 20 And these are they who said, Let us make man; and in their image man was made. 22 No manifesting form has Tao Great, and yet he made and keeps the heavens and earth. 23 No passion has our Tao Great, and yet he causes sun and moon and all the stars to rise and set. 24 No name has Tao Great, and yet he makes all things to grow; he brings in season both the seed time and the harvest time. 25 And Tao Great was One; the One became the Two; the Two became the Three, the Three evolved the Seven, which filled the universe with manifests [forms]. 26 And Tao Great gives unto all, the evil and the good, the rain, the dew, the sunshine and the flowers; from his rich stores he feeds them all. 27 And in the same old book we read of man: He has a spirit knit to Tao Great; a soul which lives within the seven Breaths [Spirits] of Tao Great; a body of desires that springs up from the soil of flesh. 28 Now spirit loves the pure, the good, the true; the body of desires extols the selfish self; the soul becomes the battle ground between the two. 29 And blessed is the man whose spirit is triumphant and whose lower self is purified; whose soul is cleansed, becoming fit to be the council chamber of the manifests of Tao Great. The mystical aspects of all religion are actually seeking to explain through symbolism the same cosmology that modern science has been trying to figure out since its advent. It is all about answering the questions of creation and first cause . How did creation and intelligence originate, and what steps led from its plausible beginning to its (and our) current state. What parts of the universe are eternal and what parts are cyclical with a beginning and end. Did all of mankind originate from a single progenitor, and what is the nature of that progenitor? If intelligence in the universe multiplies, did it all originate from a singular intelligence? What is the nature of that singularity and how did the process of fall/division or separation occur? If energy/matter can neither be created nor made, but only re-ordered, is the same true for intelligence/consciousness and what does say about the wholeness of creation. Much like the scripture quoted above, The Kolbrin contains a creation drama which bridges the gap between religious theology/creationism and the science of cosmology; and can serve as a launch point for showing the harmony between theology, epistemology and cosmology. 1:3 Before the beginning, there was only one consciousness, that of The Eternal One whose nature cannot be expressed in words. It was The One Sole Spirit, The Self Generator, which cannot diminish, The Unknown, Unknowable One brooding solitary in profound pregnant silence. 1:4 The name which is uttered cannot be that of this Great Being who, remaining nameless, is the beginning and the end, beyond time, beyond the reach of mortals, and we in our simplicity call it God. 1:5 He who preceded all existed alone in His strange abode of uncreated light, which remains ever unextinguishable, and no understandable eye can ever behold it. The pulsating draughts of the eternal life light in His keeping were not yet loosed. He knew Himself alone; He was uncontrasted, unable to manifest in nothingness, for all within His Being was unexpressed potential. 1:6 The Great Circles of Eternity were yet to be spun out, to be thrown forth as the endless ages of existence in substance. They were to begin with God and return to Him completed in infinite variety and expression. 1:7 Earth was not yet in existence; there were no winds with the sky above them; high mountains were not raised, nor was the great river in its place. All was formless, without movement, calm, silent, void and dark. No name had been named, and no destinies fore-shadowed. 1:8 Eternal rest is intolerable, and unmanifested potential is frustration. Into the solitude of timelessness came Divine Loneliness, and from this arose the desire to create, that He might know and express Himself, and this generated the Love of God. He took thought and brought into being within Himself the Universal Womb of Creation containing the everlasting essence of slumbering spirit. 1:9 The essence was quickened by a ripple from the mind of God, and a creative thought was projected. This generated power, which produced light, and this formed a substance like unto a mist of invisible dust. It divided into two forms of energy through being impregnated with The Spirit of God and, quickening the chaos of the void within the Universal Womb, became spun out into whirlpools of substance. From this activity, as sparks from a fire, came an infinite variety of spirit minds, each having creative powers within itself. 1:10 The activating word was spoken; its echoes vibrate still, and there was a stirring movement, which caused instability. A command was given, and this became the Everlasting Law. Henceforth, activity was controlled in harmonious rhythm, and the initial inertia was overcome. The Law divided the materialising chaos from God and then established the boundaries of the Eternal Spheres. 1:11 Time no longer slept on the bosom of God, for now there was change, where before all had been unchanging, and change is time. Now within the Universal Womb was heat, substance and life, and encompassing it was the Word, which is the Law. 1:12 The command was given, “Let the smallest of things form the greatest and that which lives but a flash form everlastingness.” Thus the universe came into being as a condensation of God’s thought, and as it did so, it obscured Him from all enclosed within His solidifying creation. Henceforth, God was hidden, for He has always remained dimly reflected in His creation. He became veiled from all that came forth from Him. Creation does not explain itself; under the Law, it cannot do so; its secrets have to be unravelled by the created. So in summary, ONE symbolizes the infinite primordial Most High God. Because time and division exist, we know that at some point a duality must have arisen in the supreme unity which we call God. The One became TWO; a polarity of positive and negative, masculine and feminine, light and dark, day and night, a beginning and an end. The Father & Spirit or Seen and unseen dimensions of the universe (corporal world & spirit world). Those Two further separated into the THREE; as the two bore a Divine SON. Like light shining through a prism, the One, shining through the duality created the trinity of primary colors. Red, Yellow & Blue. The Godhead of Father, Mother/Spirit and Son. The three divisions of corporal worlds and spirit worlds. As polarity and division continued the three further divided into a rainbow of SEVEN, which is the full fractal spectrum of our Galaxy’s rainbow. The seven energy levels in atoms. The seven energy densities of the universe. The seven archangels, the seven creative periods… the Seven Elohim. 7 …As also he is in the sun, and the light of the sun, and the power thereof by which it was made. 13 The light which is in all things, which giveth life to all things, which is the law by which all things are governed, even the power of God… who is in the bosom of eternity, who is in the midst of all things (D&C 88:6–13). …There is no polarity for all will be, as you would say, reconciled at some point in your dance through the mind/body/spirit complex which you amuse yourself by distorting in various ways at this time. This distortion is not in any case necessary. It is chosen by each of you as an alternative to understanding the complete unity of thought which binds all things. You are not speaking of similar or somewhat like entities or things. You are every thing, every being, every emotion, every event, every situation. You are unity. You are infinity. You are love/light, light/love. You are. [I am that I AM] This is the Law of One. This concept of the unity of God and man or at-one-ment (one-ness) pervades the Christian scriptural record. The fall was division from God (Gen 3:23–24) and to be redeemed is to be reunified (D&C 76:56–59). Christ prayed that all men “might be one with him” as he was “one with the father” (John 17:11,21). He taught that he was in the Father and the Father in him (John 14:8–11). He prayed that others might be in him. He compared himself to a true vine (John 15:1–12) just as Paul compared the many different members of the Church to the different members of a person’s body, which are all connected and part of one consciousness (Rom 12:5, 1 Cor 12:11–27). Even in Mormon scripture, Christ constantly reaffirms the unity of himself with the Father and the Holy Spirit, trying to teach the concept of one from many (3 Ne 11:27,36). He effectively pleads that man might align and unite their consciousness with his, and share in one unified collective group consciousness (Mos 18:21, 3 Ne 20:35, 3 Ne 15:17, 3 Ne 28:10, 4 Ne 1:3–17, Mormon 7:7). LDS scripture, Oahspe, The Law of One and many ancient texts all agree that this highest principle, Father or first cause is steeped in paradox. Being both beginning and end, distant and ever-present, both personal and impersonal, both knowable and shrouded in mystery. Most scriptural creation descriptions begin with a detail of how the unified field was first divided into heaven and earth—or spirit and matter. In the Hebrew account, preserved in the Bible it details how God first divided the light from the dark, then the “waters” or firmament creating “heaven” and earth. This is followed by other divisions of “positive and negative” properties such as that of the land from the sea, and man from woman, or humans from god in heavenly paradise. Although the biblical account is primarily geocentric (dealing with earth only, see Moses 1:35) in many accounts such as the Hindu sacred works, The Kolbrin, Oahspe, etc there is far more descriptive language which makes the micro/macrocosmic nature of these creation drama cosmologies more obvious. Piecing all the information in these sources together we get an idea that matter/energy in the galaxy were first separated into two great divisions which I think are best classified as “dimensions”. These are the physical and spiritual, analogous to the positive and negative, or the ideal feminine and masculine. In terms of modern physics this is the division between the proton and electron or physical nucleus and electron orbital/energy shells. The Law of One material uses a theory described by a poorly known physicist named Dewey Larson who wrote a number of books describing the universe as a product of “motion” in the unified field. He describes this primary division of “physical” and “spiritual” dimensions as time/space and space/time. In space/time or our “physical” world, the illusion of physical existence, like the atomic nucleus is created by a standing wave where velocity through space is small compared to time. In time/space or the earth’s spirit world the opposite is true and high velocity creates a more subjective and fluid reality. In other words when a person dies they become like an electron, a quickened or rapidly vibrating “light being” or “spirit” and reside within what we (from our physical perspective) see as the earth’s electromagnetic field or “heaven”. The reality we inherit there is much like what physicist are learning about electrons. In that dimension of light, “material” properties are subjective and dependent upon the observer. Oahspe similarly describes the two primary dimensions as the Corporeal and Atmospherean worlds, which are opposingly objective and subjective planes; the atmosherean or spirit sphere existing on and “above” the earth occupying roughly the same space as the earth’s atmosphere and magnetic field (20/19.24, 20.3, 21.2). Early LDS leaders as well as essentially every other credible mystic I have read describe the Spirit World as being above and part of the earth–but in another “dimension”. 04/2.2. Jehovah said: I created the earth, and fashioned it, and placed it in the firmament; and by My presence, brought man forth a living being. I gave him a corporeal [physical] body so that he could learn corporeal [physical] things; and I made death so that he could rise in the firmament and inherit My etherean [spiritual] worlds. 04/2.3. To es [spirit] I gave dominion over corpor [matter]; with es I filled all place in the firmament (even within corpor). But corpor I made into earths, moons, stars and suns; beyond number I made them, and I caused them to float in the places I allotted to them. Using the fractal analogy, it can be helpful to view the spirit world as the “mind of the earth”. So if you take our human bodies as microcosms, you can imagine our bodies like the physical dimension to the earth and our minds or imaginations as the spirit world or spirit dimension of the earth. (In many eastern traditions and holograph theory, the fractal analogy is used to assume our minds are projected into our bodily energy fields or “auras” which then interact with the fields of others through the global field.) Our bodies are commanded by our mind or consciousness (although the body can opposingly influence the mental state as well), but they have different capabilities altogether. Our bodies are concrete and bound by rigid and objective physical laws. Our mind’s consciousness moves near the speed of light and is more fluid, having the ability to imagine ourselves doing things subjectively. Our mind’s imaginations are not bound by the same rules that our bodies are yet at the same time our bodies are a product of our state of mind, which is a condition very similar to how the spirit world is often described. In the spirit world it seems that our thoughts become objective things or in other words your thoughts become reality as you essentially inherit the mental state you built for yourself in life (on an individual and group level). The spirit world is the “mind” or imagination of the world, created by the collective consciousness of all humanity and responsible for creating the reality which mortals view as our earth. For those within one of the stratified levels of the Spirit World, the rules and reality of the realm you find yourselves in are essentially determined by the group you share that reality with. If the group believes the world is a dark and gloomy place, it will be (hell). If you are imbalanced, disharmonious, mean or evil, you will go to a place with people like you, and your environment will be a projection of the groups mental state. If the group is full of life, happiness and love, this will be their reality (heaven). If your world-view and mental state is controlled by a religion, you will go to a heaven created by your religion and it will be divided into sub-realms matching the mentally created divisions of the adherents. If you strongly believe Jesus will meet you there, he will. If you believe Vishnu will meet you there, he will. If you have acted contrary to group will and inwardly fear retribution, you will likely find just that. On earth our reality is determined by the composite state of mind of ALL living & dead conscious souls and the delay between group thought or desire and manifestation is large; but in the Spirit Word things are more markedly separated causing our reality to be a result of the state of mind of ONLY those sharing our realm, and the delay between group thought and actualization is very small. Salvation and redemption truly are states of mind and are obtained by our “faith, hope and love” or the way we view the world. To use the idiom, in this life we make our beds and in the next we are forced to lie in them. This is why religion and mystics put such a strong emphasis on faith and works, because our faith or beliefs represent our desired mental environment and our works or acts are a manifestation of our true mental environment. And it is this mental environment which creates our realities in a subjective sense in this life and in an objective sense in the next. These are very difficult concepts to teach, but if you read a few thousand life after death experiences or channeled works you begin to see a cohesive picture of the principles which control the human mind and spiritual world, and you also begin to see the meaning behind all the symbolic phrases in religion which teach these principles. Take these words from the book of Alma for example. 7 …for behold, they are their own judges, whether to do good or do evil. To the intelligent, this common sense principle of cause and effect, karma or the law of the harvest is an obvious part of our human reality. But what life after death experiences suggest is that it is intensified and made far more obvious after death in the Spirit World. In the next section we will read some examples of the Spirit World and see what examples we can garner from a comparative analysis. When the physical impregnates the Spiritual a third creation is born. A divine Son. Go through the gnostic pearl and other texts descriptions of the holy trinity. Father-Mother-Son or Father-Son-Spirit. Tell of how these are symbolically teaching the same thing. Go through the symbolism of the Son. The Son is the first offspring of the eternal creation. It is not a division of the ONE or the TWO but the first new creation formed by the synthesis of duality. It is the first temporal creation with both beginning and end. It IS the beginning and the end. It is the archetype of LOVE which is the first principle with action and being. Search ‘morals and dogma’ for some good explanations. Track the symbolism in ancient egyptian, hindu and mesopotamian religious tradition. Move into how these symbols teach a principle of physics, namely that the SON is…. Use the Atom and the states of matter as examples to base everything else off of…. Good advice. Really this is destined to become a book. Right now it’s kind of a mess, the concepts are difficult and it will likely take some time to make it cohesive and palpable for most people. I’ll have to separate each chapter into a different article at some point when I get time.